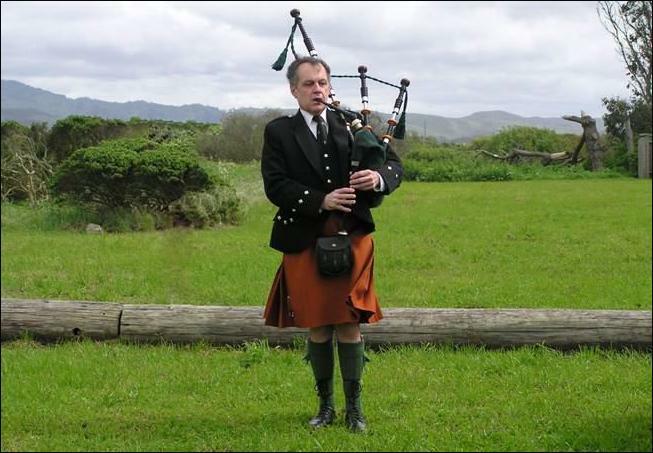 As a bagpiper, I was asked by a funeral director to play at a graveside service for a homeless man who had no family or friends. The funeral was to be held at a cemetery in the remote countryside and this man would be the first to be laid to rest there. As I was not familiar with the backwoods area, I became lost and being a typical man, did not stop for directions. I finally arrived an hour late. I saw the backhoe and the crew who were eating lunch but the hearse was nowhere in sight. I apologized to the workers for my tardiness and stepped to the side of the open grave where I saw the vault lid already in place. I assured the workers I would not hold them up for long but this was the proper thing to do. The workers gathered around, still eating their lunch. I played out my heart and soul. As I was opening the door and taking off my coat, I overheard one of the workers saying to another, "Sweet Mary 'n Joseph, I have never seen nothin' like that before, and I've been putting in septic tanks for twenty years."